DK-LOK® K Series JIC Tube Fittings consist of a body, sleeve and nut and meets the requirements of SAE J514 and ISO 8434-2 standards. They are sold as body only for use as adapters for hoses with female JIC swivel ends or as a complete assembly for flaring and connecting stainless steel tubing. The K Series JIC Tube Fittings are capable of connecting to comparable fractional and metric tube sizes without concern for changing the sleeve and nut. 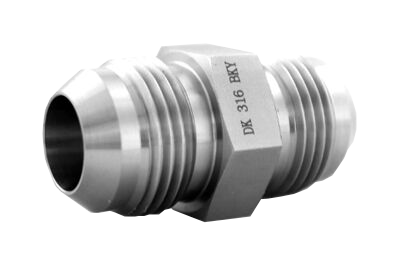 DK-LOK® JIC Series Tube Fittings are available as standard in steel, stainless steel, and brass materials. Combined with its broad line of configurations and end connection options, DK-LOK® is capable of servicing industrial and hydraulic flare fitting requirements.